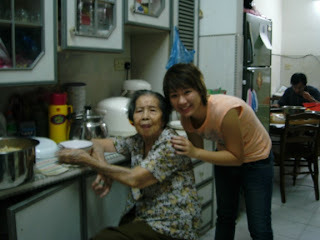 My Ah Ma whose lunar age is 91, passed away peacefully. She was fortunate as her health was good all this while. Just got weaker legs due to old age..
She had diahorrea and refused to eat..
And her faeces were charcoal black..
She waved and say "byebye" to my cousin and 1st uncle when they visited her in the evening on 5th. She never say byebye to anyone of us b4.. In fact, she dont even speak english.. I arrived with my mama on the 7th..
We were supposed to crawl in to my grandma's wake.. It was a tradition for kins that came bk from oversea to pay respect..
She refused to leave when I tried to pull her away from the coffin.. It is considered a new experience to me.. This is the first time that I actually attended my own kin's funeral.. I always thought it will be a solemn one.. But to my surprise, everything was seem joyfulz..
*yea..going to be a grandaunt...-_-"
Oh well..back to the traditional wake procedure..
Was stunned when my cousins shouted "GEt Ready for lesson!".. 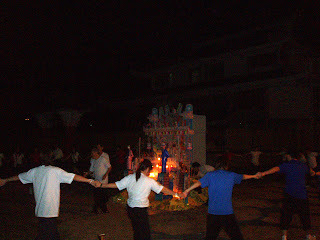 I just followed and sat on a mat and was passed with a joss stick..
okay..just one shot of the whole ceremony with my ah ma's pic in it..
AS I was saying the ceremony wasnt solemn at the start..but everything changed on the last nite of prayers..
yea..my dad scolded them..and all...hmmm..went solemn that nite..with long long prayers session.. But...one of my cousin..was quite irritating..
She laughed out loud when the taoist priest chanted our names out..
Feel so much to slap her...so no respect lo...$%#@! But I pei fu my lao er ge.. He actually kneel for the whole sessions.. There were buddhist chanting too..
We even have to cross a man-made "Na-He bridge" for 7 times & putting two 1-cent coins every cross.. Throughout the whole procedure, we kept seeing this black butterfly on the wall.. The elders were saying that black butterfly represent the dead one..
After the prayers, we proceed to burning of offerings to my late grandma..
BTW..all the funeral pic nt taken by me.. I thought it was not very nice to take.. But seem got so i post some to spread the culture! Was really heartbrking..even me cant hold back those tears.. Especially when the band played many meaningful songs.. I felt so sad when my 4th auntie wept and told me,"I wan 2 see my ma..now i cannot see her..talk to her also will not respond le..."
My ah Ma was to be buried next to my ah Gong..
None of us turned back. Not suppose to. As we dined, it started to pour heavily.. Suddenly everyone cheered out loud!!!! i was like wth...raining also happy..
After explanation from my cousins, then I knew pouring after the burial is a good sign..
Hope you will receive my message in heaven.. Your sudden departure made me felt really lost.. The feeling of losing a kin is..weird..
Hope you will do fine in the another world.. I Miss u Ah ma..